Note: This article was previously published at Patheos. The new Fox science-fiction series Almost Human premieres over two nights on Nov. 17-18 at 8 p.m. EST. Patheos was one of several outlets invited to join a conference call with executive producers J.J. Abrams and Joel Wyman, and they provided some details on how they approached the series’ development. 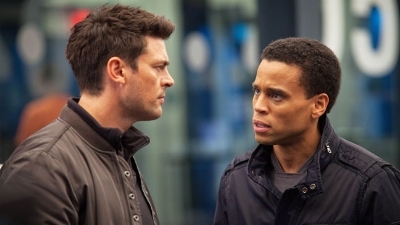 The show follows John Kennex (Star Trek’s Karl Urban) a cop in the year 2048 who goes into a coma for 17 months after a failed assault on a dangerous gang. He returns to the job when he awakes, but it’s now mandatory for all officers to be paired with an android partner. Frustrated by the new line of robots, he decides to pair himself an older model, who goes by the name Dorian (Michael Ealy). The show will follow the duo’s attempts to solve crimes and Kennex’s investigation into the gang that nearly killed him. The pilot crams a lot of information and character development into its 43-minute runtime (I’ll be posting a full review later this week). However, Abrams and Wyman acknowledged that the first episode of a show isn’t always a good indication of what’s to come. The show is being produced through Abrams’ company, Bad Robot. Abrams and Wyman were previously executive producers on another Fox science-fiction series, Fringe, which ended its five-year run at the beginning of this year. Almost Human boasts a prestigious cast, including Lili Taylor, who plays Kessex’s boss, Captain Maldonado. The part was originally supposed to be cast for a man, but when the producers heard she was interested, they jumped at the chance to bring her on. Golden Globe nominee Michael Ealy stars as Dorian, an android of an older model that was discontinued because they resembled humans a little too closely, which made them emotionally unpredictable. Unlike the newer models, the DRNs are soft-spoken, colloquial and capable of empathy. He seems so human that Maureen Dowd recently compared the character to Obama in The New York Times. That does seem to be the case in the pilot. Kennex is brash, abrasive and suffers from PTSD. He also refuses to accept androids as a valuable part of law enforcement, which sets his partnership with Dorian off to a rocky start. He lost his leg in the assault that put him into a coma, and it’s been replaced with a synthetic limb. His body has trouble adapting to the new technology, however, largely due to his psychological distrust of robotics. Wyman said that he wanted to create a show that was different from Fringe, which developed a complicated mythology and tonally lent itself to being serious and contemplative. Almost Human is going to have larger serialized parts of its story that will gradually unfold, but it’s going to be a bit more action-oriented. It also will play out like a traditional police procedural from week-to-week, but in this new futuristic setting. The moral issues raised by robots will be a major theme of the show, and the team even consulted with a robot ethicist at MIT. Wyman said he came away feeling like as technology continues to develop, the world of Almost Human might not be very far away. It won’t be long until there are synthetic creations that, while not human, are sentient creatures. The concept of a futuristic world dominated—or at least, shared with—robotic humans is one that’s frequently explored in science-fiction. The city in Almost Human feels heavily inspired by Blade Runner; it’s dirty, grimy, neon-lit, and influenced by Asian culture. Wyman admitted that that film is one of his favorites and a clear reference point for the show, but he also added that he hopes Almost Human will ultimately feel a lot different. For one thing, it’s more optimistic.